Who’s using a Cloud Browser today? YOU’D BE SURPRISED. Whether for threat intelligence, handling sensitive data, or providing safe and anonymous access to the public web, a Cloud Browser lets you outsource your risk and increase your control over the web. Many believe your browser betrays you. Few have asked themselves: What is the cost of running a “free” local web browser in your organization? Can IT take control of the off-the-shelf unmanageable non-secure app that comes with our computers? Join this webinar to learn how IT can take control using a more secure, anonymous, disposable, productive, and compliant option to the web browser. In this webinar, we’ll cover all the key enhancements in the new Silo release, including branding and personalization, and you’ll learn how your users and administrators can take full advantage of them. We will make sure to leave time at the end of the webinar to answer questions. Kevin Sullivan spent 22 years in law enforcement before retiring from the NY State Police. He was the New York State money laundering coordinator at The NY HIFCA (High Intensity Financial Crimes Area) El Dorado Task Force at the NY HIDTA (High Intensity Drug Trafficking Area. This is the largest money laundering task force in the world. In this webinar, Kevin will discuss how organizations can maintain a quality AML program. 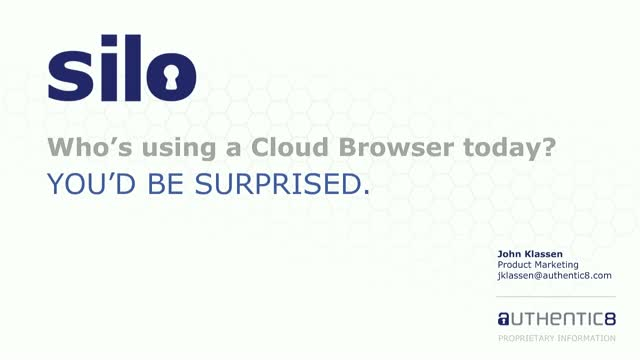 Learn how the Cloud Browser can keep your organization secure. Founded in 2010 by principals from Postini, Authentic8 is redefining how the browser is used to access sensitive web data. Silo, our flagship product, is a cloud browser that creates an insulation layer between the computer and potentially dangerous content. Silo helps manage login credentials, access controls, and data use policies. Silo is built fresh at session start and destroyed at session end, ensuring that users remain secure, compliant, and anonymous online. Title: Who’s using a Cloud Browser today? YOU’D BE SURPRISED.